"My business has more than tripled since I got this program! I have no idea what I did before this. It has completely changed my life and the way I do business. I have more business than I know what to do with. I had to hire someone!" "I’ve been posting vehicles on Craigslist since ’06, and we’ve been able to maintain a 98 percent penetration rate for our ads across the country with WebManager. We haven’t had problems with ghosting or flagging." "One of the things I like are the semi-custom templates. I get nothing but rave reviews on the way that my website looks. It’s very functional, extremely easy to use and follow, and it doesn’t look like everyone else’s." "My sales rep, Bill Tizabi, has been great at keeping me up to date on the constant changes. His suggestions have helped our business stay in the forefront of the new technologies as they come out. At Bill’s suggestion, we switched from our old web host to WebManager and have been astounded at the results. When Bill calls, I want to listen to what he has to offer. It always works!" 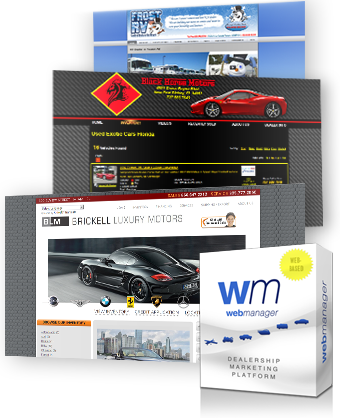 "I decided on WebManager because I’m not paying $600 a month to have my website maintained. Our clients tell us they love how easy it is to navigate our site. [WebManager] gave us a really great, unique look that fit our outdoorsy, campground theme." "We’re really happy with WebManager. It’s generating 90 percent of our web traffic, yet it only costs a fraction of what the major lead providers and other services cost." "I am not tech savvy. [WebManager allowed] me to customize my website the way I wanted it to be promoted and represented...I make the changes, additions, [theme] colors and even the color of the car. It’s very easy to understand, very simple. I can’t say enough about these guys." "My favorite part [about WebManager] is the amount of control you have over your own website content. You don’t have to rely on someone over the phone to make a change." "I think [WebManager’s Craigslist tool] one of the best auto-post utilities I’ve ever had. It’s one button; very simple and easy to use. The customer service is excellent as well. They take their time. They don’t rush you." "Having our dealer management software feed information to our website and the online marketplace has been pretty invaluable for us. It keeps us away from computers and on the floor with our customers, which is where we belong."